Who doesn’t have one or two old baskets lying around at home, whether it be a traditional picnic basket or your everyday straw tote? Imagine being able to transform these into stunning works of art within just minutes. Thankfully, we’ve actually rounded-up 30 incredible tutorials to help you achieve just that! From adornments such as pom poms, flowers and tassels, to makeovers which use easy-to-find materials such as paint, glue, sequins, and yarn – there’s just no limit to your creativity when it comes to these crafty projects. Two-tone baskets with pom pom adornments are on-trend right now, so if you have a basic sea grass basket like this one, why not give it a pretty makeover, just as Coastal Bride has done? We love the pastel color scheme! Who knew that customizing your straw baskets was this simple? Angi Cupcakes has actually painted a heart design on hers and she’ll show you how you can recreate this look in her video tutorial. How great does this preppy painted argyle pattern look? It instantly transforms a plain straw basket into something that’s quite stylish! Atta Girl Says has the full tutorial. Here’s a pom pom clad straw basket with a difference! Burkatron has actually tied pom poms all over the front of her basket tote for a quirky and fun look. This DIY straw basket makeover will literally take you ten minutes to complete! Simply buy some dollar store baskets and paint either the bottom or top in a color of your choice. Thanks Burkatron for this easy idea! This DIY picnic basket makeover is amazing! We had no idea that decoupage could produce such fantastic results. To see the full tutorial, check out Create and Babble’s website. Doesn’t this DIY ombre yellow straw basket look gorgeous? It instantly adds color and style to any space. You’ll love the step-by-step guide from Delineate Your Dwelling. Design Improvised has certainly come up with one way to add some much-needed color to this basket tote! We love how she matches her pom poms to the painted accents. Fancy giving your picnic basket a metallic makeover, just as Design Improvised has done? You’ll love how it shimmers in the sun, as well as how easy it is to do! Here’s not one, but two fun ways to add some flair to your straw baskets, courtesy of DIY Candy! These look great with plants in them too as they add a geometric design to your space. Perhaps one of the best rope basket DIYs we’ve ever seen, DIY Candy has actually created a basket that’s worthy of being called a masterpiece! It’s the perfect weekend accessory, or would even look great as home décor. Honestly WTF has created a basket makeover that we’d like to call ‘tassels galore’! Mix and match your color scheme for a look that you’ll love. Tassels and pom poms on one basket? Now that’s our ideal DIY makeover! Made in a Day will show you how to recreate this crafty and cool look. Who knew that a thrift store or dollar shop basket could be turned into something that looks as though it’s straight out of West Elm? Make and Do Crew certainly did, and now they’re here to show you how to recreate the look. Here’s another cute picnic basket makeover that can be achieved within just one weekend! My Shabby Chateau has certainly come up with the goods. Speaking of DIY picnic basket makeovers, Not Just Paper and Glue has created this red hot version that’s sure to turn heads! We love the monogram design too. This is certainly one basket you’ll want to put all of your eggs into! Paper & Stitch has a wonderful tutorial to teach you how to add a whole lot of spring flowers to your beloved basket. You can also easily transform a plain basket into something that’s both coastal and chic! Petticoat Junktion has the full tutorial to teach you how. Here’s another great DIY basket makeover idea, this time from Polished Habitat. It involves paint, yarn, and a whole lot of other amazing craft materials you’ve got lying around at home! If you want a basket makeover which is both shabby and chic, then you won’t want to go past this tutorial from Romantic Home! The inclusion of lace doily is totally genius. Wow, what a wonderful way to upcycle an old basket! Sadie’s Season Goods has turned hers into a beautiful floral statement piece to hang on her front door. How adorable are these DIY decorated baskets from See Kate Sew? If you’ve got some material baskets like these at home, you can easily add fun painted shapes or designs. Here’s a before and after shot of Setting for Four’s beautiful West Elm inspired basket makeover. Doesn’t it look gorgeous? Here’s a sparkly and spectacular DIY basket makeover which involves sequins and all things related to the seaside! 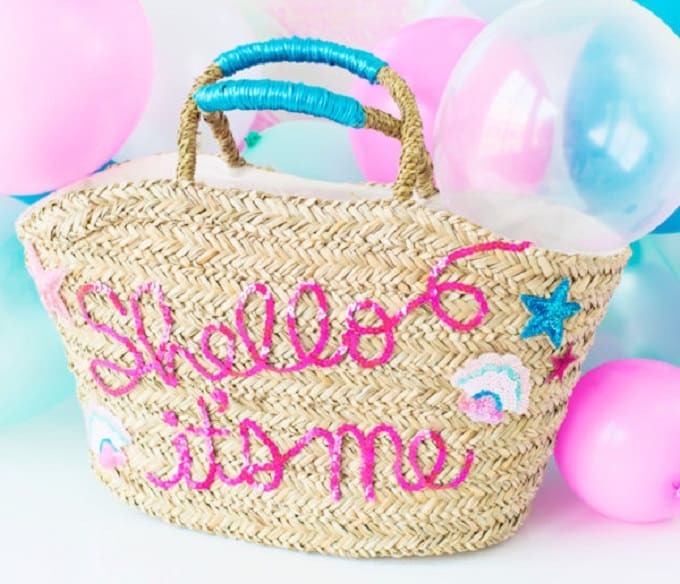 Studio DIY has created a mermaid-esque basket that’s very crafty. Here’s a very fun fiesta-inspired ‘hack’ to jazz-up any straw basket! Sugar and Cloth has a great tutorial to help you achieve this colorful and fun look. Now here’s a DIY basket makeover that’s refreshingly different! Tell, Love, and Party has come up with a design that’s easy to create, plus it looks amazing. The Chronicles of Home loves pom poms as much as we do, so she’s created a fun tutorial to help you transform your baskets into cool and colorful creations. They look great when displayed on a shelf like this! Just look at what you can produce using a bit of paint and pom pom trim! The Lovely Drawer is the talented blogger behind this DIY tutorial and we don’t think you’ll want to miss it. When it comes to basket makeovers, your bike doesn’t have to miss out! The Paper Mama has created a wonderful DIY tutorial that you’re going to love. You could even makeover a loved one’s bike as a surprise for them! Fancy a flamingo on your favorite basket? Luckily for you, Weekend Pursuits is here to show you how! This step-by-step guide is super easy to follow too. There you have it – 30 DIY basket makeovers that are both fun and easy to do! Which projects would you like to try your hand at? We’d love to hear from you in the comments section below! Thank you for including our pom pom basket!